Chances are, you or someone you knew was plagued by ear infections as a child and the painful, ringing memory still sends a shiver down your spine. Now, when looking at your child’s tiny auditory orifices, you are gripped by a compulsion to grab a Q-tip after every bath. 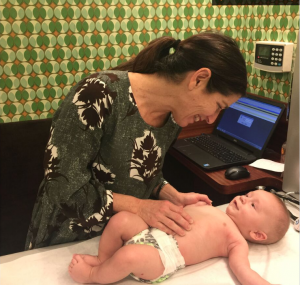 It’s natural and we hear you, but as pediatrician, Laurie Schulwolf, MD asserts, over-cleaning your little one’s ears could lead to greater problems. Otitis media is an infection in the middle ear, the labyrinth behind the membranous divide where trouble can start; it causes pain. If there is fluid and mucous in the canal, that is a sign of otitis media with a rupture. Infections of the middle ear are usually dependent on age and genetic factors. Some simply have smaller ear canals, so if you and your spouse suffered from reoccurring ear infections as a kid, chances are, yours little one may be in the same boat. The good news is, as children age, their ear canals grow and change shape, allowing obstructions to pass through more easily. Schulwolf recommends teaching your child to blow their nose at an early age, as this can be a great help with reducing middle ear discomfort and infections. Mucus buildup can be irritating for all sorts of reasons, so keep the tissues handy. If your child has taken a dip in a mucky creek or something of the like, pop them in the bath and let clean water run in and out of the ear. Clean bath water will not cause an infection of the ear canal even if it sits in there afterwards. When it comes to middle ear infections, or otitis media, the body can take care of most viral or bacterial infections on its own. If your child is still experiencing pain or fever after 48 hours, or if there is fluid or mucus in the ear canal, it’s time to seek medical attention. If your little one is under six months old, please feel free to make an appointment at any sign of fever. If your child is showing signs of otitis externa, an infection of the ear canal, you will have to make an appointment. The doctor will most likely give your child antibiotic ear-drops and you’ll be good to go. And when it comes to good old earwax, let it be, unless you notice a hard blockage that you are unable to remove using safe, nonintrusive measures. If there’s something in there you don’t know how to handle, let a doctor deal with it. After all, that’s what they’re there for! In closing dear parents, unless some greater health issue is at play, don’t fear the ears. They may not be perfectly evolved mechanisms, but with a little care and minimally invasive means, they’re pretty darn awesome. We can’t promise that your little ones won’t have to go through the proverbial “ringer” a few times, but take comfort that this is par for the course and will ease up as they age. For more information on Laurie Schulwolf, MD or Tribeca Pediatrics, please call or visit our webpage.